One trip betting for a lot of fun began since driving the car for 6 hours from Bandar Lampung to Krui. 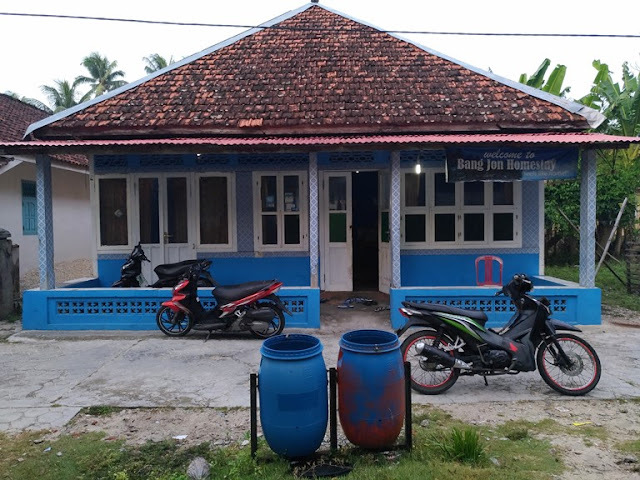 It was 8 pm when we arrived at Labuhan Jukung, where we stayed before we continued our journey accros to Pulau Pisang the next day. 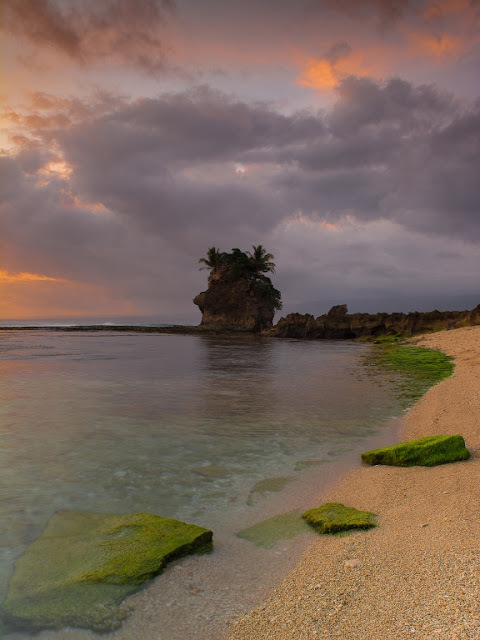 Labuhan Jukung is known as a tourist area that presents the beauty of the beach and sea with spectacular sunset that can be enjoyed every afternoon. High and long waves with surfers dancing with waves. The Port of Kuala Stabas Krui becomes the starting point of the crossing to Pulau Pisang. Just beside the harbor there is Bukit Selalau, a favorite place for people to take pictures and sit around enjoying the coastal scenery with rows of hills and Mount Pugung in the distance. After wearing a life jacket, installing a backpack cover, and storing the gadget tightly in a waterproof bag, jukung (a kind of traditional boat) hurried leaving the port. Ten people in one jukung, according to maximum capacity. The universe blessed our journey. It gave us clean blue sky, bright sunshine, and wind the caressed the face. FOR TOURIST visit Pulau Pisang, the opportunity to see dolphins on the high seas can also be obtained. On the day of departure, we did not plan to hunt the attractions of dolphins. Focusing on the mainland exploration activities of Pulau Pisang made us want to hurry up. Even so, the eyes were still sweeping the ocean, hoping to meet with hordes of dolphins. At 10.00 am our boat began to dock towards the beach near the pier of the east side of Pulau Pisang which is no longer functional. In this section, Pulau Pisang overlooks the mainland of Sumatra, precisely facing Tembakak Village, Karya Penggawa Subdistrict, West Coast. Our boat rested directly on the beach. Not far from the dock there was a large wood that was put to sleep and painted with the words “Welcome Pulau Pisang”. Yes, we had arrived on Pulau Pisang. One rare opportunity to be on a rather hectic island away from Bandar Lampung. The area of Banana Island is about 200 hectares. Located of Tembakak Beach. Currently, it has become one of its own sub-districts and is inhabited by people panorama. Charming old and antique houses to photograph. Old school and Sound Signs Towers, the heritage of Dutch. The house where the fifth Indonesian president’s husband ever lived. The activities of the residents in the morning. Clove gardens are the main commodities of the islanders. Big waves in many spots. Craftsman of gold yarn and tapis (a kind of traditional cloth). To see it all, not enough by just a short visit. Much can be seen on Pulau Pisang, especially the beauty of the sea and its beaches. There is a snorkel spot with an unspoiled underwater panorama. Charming old and antique houses to photograph. Old School and Sound Signs Towers, the heritage of Dutch. The house where the fifth Indonesian president’s husband ever lived. The activities of the residents in the morning. Clove gardens are the main commodities of the islanders. Big waves in many spots. Craftsman of gold yarn and tapis (a kind of traditional cloth). To see it all, not enough by just a short visit. Spending the night here is more complete. More time can be used to see and do things. Swimming, walking around the island, enjoying the typical cuisine. Staying at a community home has added value, making it easier to recognize the culture and habits they have, whether through chatter when interacting directly, from daily activities, or from the food they serve. TO EXPLORE the island to the far, we rented a motorcycle at a price of Rp 60.000, - per day. It can be used to tour the island all day. The motor can be ridden alone. If required, a guide can be hired to accompany the tour. The first place we visited was the State Elementary School (SDN) of Pasar Pulau Pisang. Based on the existing archives, the school was founded in 1892, built during the Dutch occupation, and still stands today. It has been renovated several times, without changing its original shape. The original building stands on the front, consisting of 5 classrooms. While the additional building is in the back. High and wide door shape, characterizes Europeanstyle building architecture. Without a window but the top wall is made perforated as the air circulation. The village road made of cement, its length to penetrate the clove plantation which became the main commodity of Pulau Pisang. In the clove plantation belonging to the residents there is Menara Rambu Suara (sound sign tower). The five story tower located on top of this hill can be climbed in turns and carefully. There are no guards in the tower, so no ticket has to be paid. The undeniable charm of the West Coast is presented from the height of the tower. The view of the sea with its beautiful water color gradation. Rows of hills on the mainland of Sumatra Island in Lampung. Coastline, white sand on the beach, waving palms, rooftops, coconut and clove forests, until the endless wave of waves sweeping the beach, all looking stunning. We also went to Batu Gukhi, the last destination of the day. The rolling waves I saw in this place, created long and high waves toward the shore. Many times without stopping. But this is the paradise of surfers, as well as photographers. White sand beach to the south is suitable for a relaxing swim or just a soak. Pulau Pisang is quite famous for making Tapis Lampung fabric. Many crafters of Tapis fabric and gold embroidery can be found on this island. We came to one of them to see first-hand the making of Tapis fabric with traditional method. Mrs. Erdalena, one of the Tapis crafters we met, welcomed us kindly. On the porch of her house there was a special table that was used for the process of fabric work. Tapis made by Mrs. Erdalena were in the form of fabric, some in shawls. While the gold embroidery was made in the form of door curtains that were usually used for certain events. The price range of Tapis fabric that Mrs. Erdalena sold was Rp 3 million per sheet, while the door curtain was Rp 1.5-2 million. The crafters of Tapis on Pulau Pisang often received fabric orders from outer island buyers or outside the region. PULAU PISANG did not only reward us with valuable experience and lessons, but also the natural wonders presented in plain sight. On our way back to Kuala Stabas, we had different stories from the departure trip. 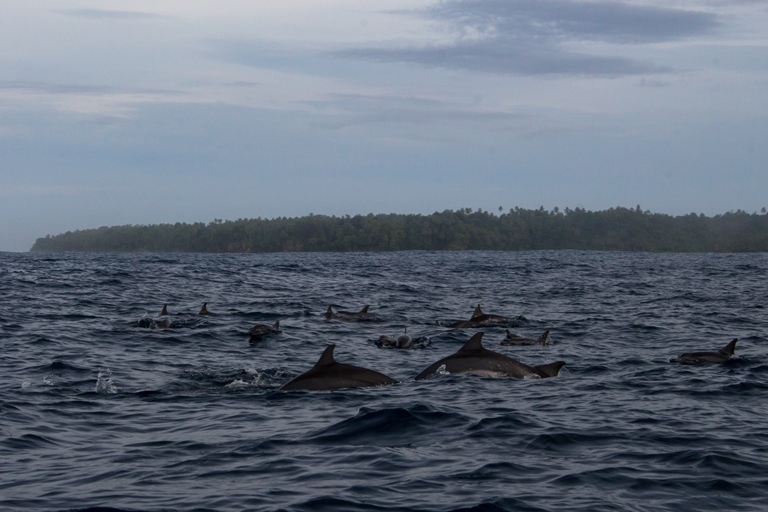 Not until 20 minutes since the boat left Pulau Pisang, a horde of dolphins emerged far more than I’ve ever seen in Kiluan. They came very close from the front, right side and left side of the boat. The camera was ready, but always lost its speed. Maybe it was just time to see with the eyes, not with the camera lens. The appearance of the dolphins did not last long, but I saw the faces of friends so pleased. All shouted joyfully and laughed satisfiedly. Until finally the dolphins did not appear anymore. Disappearing in the vastness of the oceans of the West Coast. The trip exploring Pulau Pisang provides a rewarding experience, as well as beautiful memories. The sea and its lands offer an exciting adventure that will always be missed in the days to come. No need to spend too deep to fly hundreds to thousands of kilometers leaving the hubbub of the capital. Simply direct yourself to Lampung, to the natural beauty of Pulau Pisang. 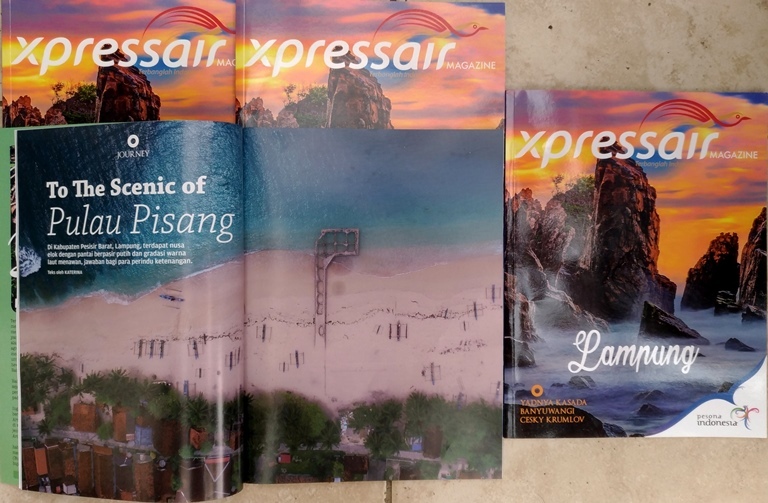 mbak Katerin inggrisnya top euy.. jadi pingin belajar nulis blog pake bahasa inggris juga..
Iya, kulineran di pulau memang paling dicari. Entah itu olahan ikan segarnya, atau masakan khas dari sayur lokal. Kapan sini lagi? Ikut! Tapi jgn pas banyak festival, lbh asyique jalan sendirian. Haha.